Brent Harvey drops into Kilmore Toyota for the Toyota Good for Footy program. 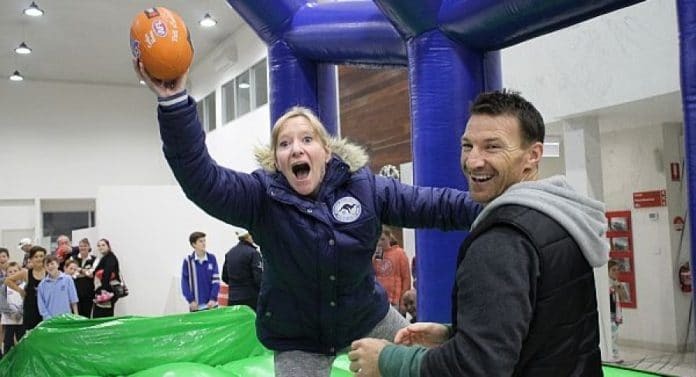 FORMER AFL premiership player and North Melbourne legend, Brent “Boomer” Harvey was a well-received guest at Kilmore Toyota last week as part of the Toyota Good for Footy program. The Toyota Good for Footy program is travelling across Victoria each week throughout the 2017 AFL Toyota Season to promote and support community football and the Good for Footy Raffle. Since its establishment in 2005, the Good for Footy Raffle has raised over $2.9 million for grass roots football. “It’s great to get out to these kind of events and see the kids. I can remember when I was young and how great it was to see and meet an AFL footballer,” Harvey said.